Sixty-one years after Australian servicemen were deliberately exposed to the fury of nuclear bomb testing at Maralinga, lawyers are seeking a ruling by the Australian Human Rights Commission on behalf of of 295 survivors. Joshua Dale, a human rights law specialist at Stacks/Goudkamp in Sydney, said the group would ask the commission to rule that Australia breached the Universal Declaration of Human Rights by allowing the men to be exposed to radiation despite knowing the dangers of exposure. “We hope the AHRC will examine the case and recommend to the government that it right the wrongs that have been done to these people over decades, and provide compensation and the gold card for medical assistance,” Mr Dale said. It could be the men’s last grasp for justice. 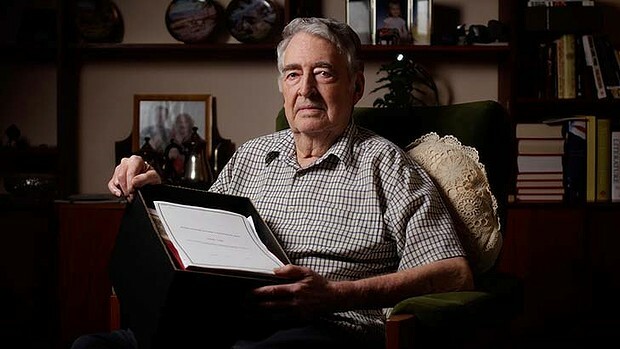 Alan Batchelor, now 82, spent six months at the Maralinga site as a lieutenant and second-in-charge of an engineer group of 83 men. ”Most of the people who were in that engineer group are dead now,” he told Fairfax from his Canberra home. Many died from cancer. A 2006 report commissioned by the Australian government showed the Australians working at the Maralinga and Emu Field testing sites were 23 per cent more likely to develop cancer than the general population, and 18 per cent more likely to die from cancer than the general population. But, in a blow to the men’s claims for compensation, it concluded it was impossible to conclude whether that was due to the men’s exposure to radiation. Before his posting to Maralinga, Mr Batchelor and his wife had a healthy child. A year after Mr Batchelor returned his wife miscarried a badly deformed foetus, his submission to the AHRC states. He has since developed myasthenia gravis, an auto-immune disorder. A 1985 Royal Commission found that then-Prime Minister Robert Menzies approved the British government’s request for Australia to host nuclear testing without referring to the cabinet and without scientific knowledge of the potential hazards involved. ”A stated aim of the British Nuclear Test Programme was to discover the detailed effects of various types of explosions on equipments, stores and men with and without various types of protection,” the men’s claim states. The Australians – dressed in shirtsleeves and shorts – stood within 50 yards (45.7 metres) of the test site, Mr Batchelor said. The British scientists wore protective suits. In January a British court overturned a bid by traditional owners to seek compensation, ruling there was no proven link between ionised radiation and cancer. It followed a ruling by Britain’s Supreme Court last year that blocked a bid by 1000 British Maralinga veterans to seek compensation over the tests. The decision quashed the hopes of 320 Australian servicemen, who had hoped to join the case. Almost 100 of those men have now died. Greens Senator Scott Ludlam welcomed the application by the men’s lawyers to the AHRC, and said the men deserved compensation. He said traditional owners from the area should also not be forgotten.